Theatre in the Imperial Summer Palace complex. Built 1895. 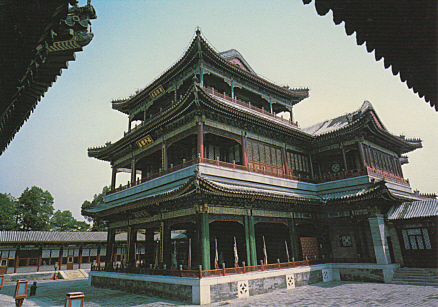 Used for Chinese opera performances for the Royal family. 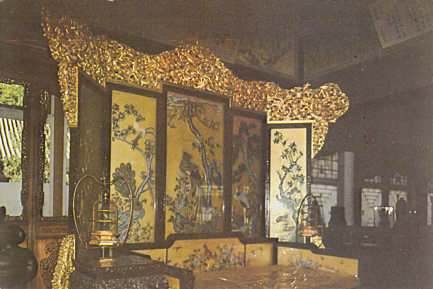 Empress Dowager Cixi used the neighbouring "Hall of Nurtured Joy" (also known as "Hall of Ease and Joy") for watching performances, sitting on a special luxurious chair. Reverse Text: "The Deheyuan Theatre"
Reverse Text: "Hall of Ease and Joy - the chair from where Empress Dowager watched theatrical performances."